Blade Tech Classic Knife & tool Sharpener & Canvas Belt Pouch Anodised finish, Aircraft aluminium body and rivets, Polished tungsten carbide technology, Made in the UK. The Classic will sharpen almost any straight edged knife including hunting knives, kitchen knives, fishing knives, butchery knives, pen knives etc. along with shears, household scissors, loppers, secateurs, scythes, garden edging spades, axes, lawn mower blades and more! How do I use a Blade Tech Classic to sharpen knives? 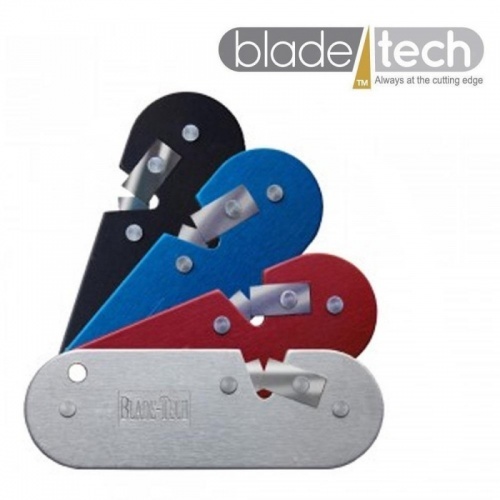 Place the Blade Tech Classic™ flat and overhanging the edge of a flat surface. Place the knife blade in the centre of the wedge or “v”, and draw the knife downwards with light pressure. This will sharpen both sides of the blade at once.